Jammu, June 30: Frequent disruptions caused by heavy rains have caused to suspend the Amarnath Yatra from Jammu. While the over 2,000 pilgrims who were stranded in Udhampur, left for the Pahalgam base camp this morning, a police officer said. "The yatra from the Bhagwati Nagar base camp here has been suspended. 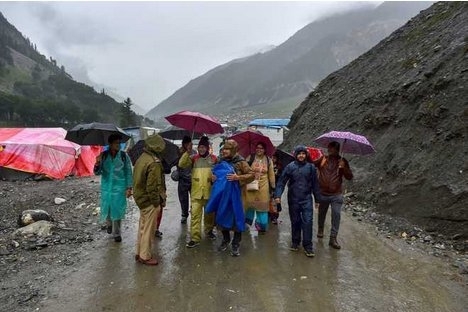 No pilgrim was allowed from here but the stranded convoy, carrying 2,032 pilgrims, including 315 women, left for Pahalgam base camp in south Kashmir this morning," he said. Media agencies say that a majority of the pilgrims in the third batch who left the Bhagwati Nagar base camp yesterday were stranded in Udhampur district due to frequent disruption in the flow of traffic on the Jammu-Srinagar national highway. "After getting the road clearance, the pilgrims were allowed to start their journey towards their destination this morning," the police officer said.